In the newsletter we send 1 free preview lesson per week. This is a random lesson from 1 of the courses #dutchgrammar-1, #dutchgrammar-2 and #dutchgrammar-3. We respect your privacy. You can unsubscribe any moment. After submitting: confirm the e-mail. * One-time fee for 1 year access. No automatic prolongations. Temporary discount; price excludes VAT (value added tax – rate dependend on EU-country). Outside EU no tax is charged. You already know some Dutch grammar? Do the test! What do students say about the premium version? Congratulations for the great course. it is not usual that learning grammar gives any fun to students but I think your grammar course makes the historic difference – I really enjoy doing it; good structure, good balance of rules, explanations and examples. the explanation of the rules are clear and easy to remember. this is very rare in language courses. the vocabulary and the hand-outs are great and it is a very good feature that one can also print them. I have been through Lesson 25 until today. It is a GREAT course. Before you launching this grammar course, I had read a bit here and there about Dutch grammar for beginners from internet resource, but thery were all in text and not easy to follow. Your course to illustrate one point per course is the best way ever for a remote self-learner. It is very clear and easy to follow. I like very much the design of your course slides, the highlight of words/fonts works perfectly on the point you want to tell. Overall it is EXCELLENT. I started to follow your couse from the 1000 words, but only knowing words cannot help me to understand sentences. Now with the new grammar course, i think the combination of both provides an ideal internet course for any remote Dutch beginners. I would like to congratulate you for the quality of your videos, which are as clear as concise. I really liked watching your course, all the more so as I am pretty fond of grammar. I’m very greatful for your lessons. It’s very easy to understand, compared to the books i had been reading (before i found your lessons). Now i even understand the books better with your lessons! Thank you. Do you think grammar is boring? My opinion is that #dutchgrammar is an interactive course that catches your attention, keeping you focused in that lesson, and you learn more easily. And if you still have trouble learning, take the handouts with you wherever you go, and can always remember the lessons! My blog about studying Dutch with #dutchgrammar, you can read here. I would like to congratulate you for being a good teacher for us, students who wants to learn Dutch language. At first I felt so crazy to learn the language and I don’t know where and how to start speaking the language but when I watched your video I learned how to create sentences. I was so happy that my sister introduced your website to me. May you continue what your doing and hope that you won’t get tired of it because you’re a big help for every person who wants to learn. Thank you for keeping an eye on my Dutch grammar course progress. I started so well and my Dutch got so much better after only a few grammar lessons. Everyone around me was positively surprised about it. And I also got such a wonderful feeling about my progress. In fact, I felt much better then after completing the intensive Dutch course last year. I really appreciate how well is your course organized. Once again, thank you so much for all your great work. 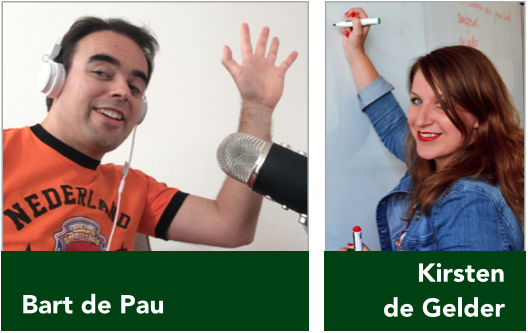 I have enjoyed the #dutchgrammar course very much, it has been very helpful and makes a lot more sense than other dutch grammar video series I have tried. You explain things very well in a way that is easy to understand. I’ve completed the first 45 lessons and feel I’ve learned quite a bit. I was not really a beginner when I signed up for your course – had been studying Dutch from various internet sources for a while – but had not followed any grammar course. I had caught some rules “by ear” here and there, but nothing systematic – and some “rules” I had gotten plain wrong. So, I really appreciate your course ; I only wish there was more. Seriously, I’ve thoroughly enjoyed your courses, and I recommend them highly. To be honest, I REALLY appreciated the weekly listening exercises — about the Klompenmuseum, and all the rest. The videos were challenging for me, but I know that they helped me “push the envelope” for the Dutch exams. In my humbel opinion you are the best dutch teacher i ever experience till now.. Considering that i had experience more than 35 teachers in persone or on line during the last year.. Your way in teaching is unique and boring free.. And thats not a complement its just the truth. I have searched for so many Dutch courses online but yours is the only and the best online course I came across. I am truly happy and satisfied with all the courses. The first thing I do when I wake up is make my coffee and practice all the lessons you have sent me. My grammar is getting better every day. I practice my Dutch at work with my colleagues. They used to make fun of me because of my bad grammar and they always say to me that I speak dutch with English grammar rules. But now thanks to your course I am adjusting that. Initially, I have added myself to your course so I can better my Dutch but it became as well so useful for My husband who also have to do inburgeringsexamen soon. You can access your premium course #dutchgrammar through the 'student profile'. So not through the tab 'online courses'. More detailed instructions you find here. All #dutchgrammar courses are sold as 1 year licenses. This way I can keep the price attractive. If you want to use it for another year, you can purchase a new license and you will see the course (with your results) back in your student profile. However, if your course disappeared from the profile less than 1 year after purchase. The two most common reasons - when someone does not see #dutchgrammar listed in the student profile, right after purchase: (1) there was a problem with the payment -> please check your bank first (2) a different e-mail address was given during the purchase; in that case step-1: logout here and step-2: login with the address you used during the purchase. Please note, this form is only for questions related to my premium course #dutchgrammar!